The Chilean navy has sacked the head of the country's oceanography service, Mariano Rojas, after accusing him of failing to issue a clear warning of a tsunami caused by last week's earthquake. The navy has also launched an inquiry into how the disaster was handled. The official death toll has now been reduced to 452 from 800, but hundreds of people are still missing. UN Secretary-General Ban Ki-moon is due to visit the sticken city of Concepcion today. He arrived in the capital Santiago yesterday to assess the damage. His visit comes on the back of three strong aftershocks. A first 6.2-magnitude aftershock jolted people awake at 9.20am (Irish time) on Friday, just six days after the 8.8-magnitude quake which has left some 2m homeless. That was followed by a 6.8-magnitude tremor and another measuring 6.6. 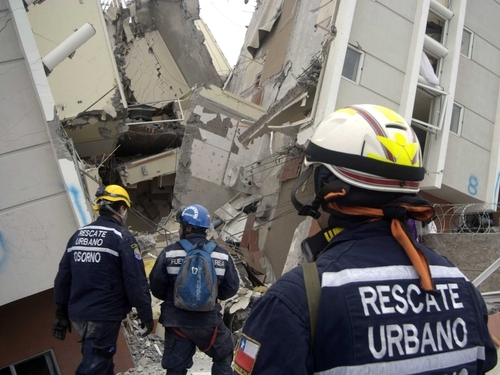 Some damaged buildings in Concepcion collapsed, but the national emergency services said the aftershocks caused no injuries or serious damage. Chile plans three days of national mourning starting from midnight on Sunday, when flags will be hung on front doors out of respect for the dead.